I am the journalist Oscar Losada. I was born in the city of A Coruña (GALICIA). I have developed my professional work in the cultural and sports journalism. Within the music department I specialize in world music. 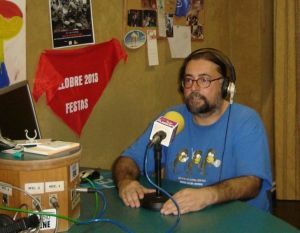 I started with the radio program "O regueiro das fadas" in tune Radiocadena, where I performed for three years. Subsequently I reported on roots music in the weekly A terra nosa and the newspapers El Correo Gallego and La Voz de Galicia. In 2000 I joined as freelance newborn newspaper La Opinion A Coruna, where I continue to write a weekly page of ethnic music. Thirteen years ago created the Premios Opinión Folk Music Awards with the intention of prestige and reward outstanding Galician musicians of the year. I was editor, and author in some numbers, of the bi-annual musical revue Cartafolk centered performed by outstanding artists of great value from Galicia and international.